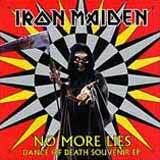 The No More Lies EP was released to celebrate the awesome success the one and only Maiden received with their latest masterpiece, Dance Of Death and the subsequent tour. This is Maidens and the record companys way of saying "thank you" to us legions of fans and I might say that it’s a damn good way. The minialbum officially includes three songs. The original album version of No More Lies is pretty much the same as on the record, which means its damn good. The orchestral version of Paschendale kicks my favourite track off DOD up a notch with the grandiose orchestras pumping up the tales of bloody mayhem. A very good bonus. Then the electric version of Journeyman is third and I must say that I´m glad they put the acoustic version on the record, cause its much better then the electric one. This “plugged” version is good, but its just too plain to beat the special beauty of the acoustic version, which is awesome. But the real treat on this disc comes in the form of the hidden bonus track that comes after you let the silence run far enough after Journeyman. The hidden track is the DOD song Age Of innocence, sung by Maidens all time favourite drummer and nose model, Nicko McBrain. That’s right, good ole Nick stepped in front of the mic and sang the song in his own peculiar way. He sometimes sings, mostly tells jokes and even harmonizes parts of the guitar solos with his voice, which is quite frankly hilarious. A must hear for all Maiden fans. The production is just like on the DOD album, awesome and very punchy even in the rawest parts. The package also includes a live video of No More Lies that was recorded live on the latest tour, and an Iron Maiden wooly wristband, which in my view is a very nice treat. Keeps the old paw from getting sweaty while rocking out. For the price of 7 euros, over a half hour of excellent music and the wristband, is a good package. Just goes to show you that this band likes it fans as much as we like them. A nice appetizer to quench the thirst that grows each month that goes by without a new Maiden album. A must get for all Maiden-fanatics, but be quick, cause this EP is a limited edition release, so its not out there for long. Up The Irons!! !